An honest, real-life review of owning a Pottery Barn York Sofa. Includes our specific order details, our thoughts upon arrival, the best fabric option, a three-month review, and a one-year review. Tons of helpful information if you’re considering ordering a Pottery Barn couch! Since the day I hit the ‘Place Order’ button on our Pottery Barn York Sofas last September, I receive emails and messages weekly asking about them. And likely for good reason! I had a hard time finding many Pottery Barn sofa reviews, let alone one for the York Sofa. It took me several months to finally decide to go through with the couch purchase and I did a lot of research prior to that. In fact, you may remember I had a whole post dedicated to white and neutral sofas when I started searching last spring. However, at the time, I couldn’t find many reviews, specifically on the Pottery Barn York sofa that I had my heart set on. 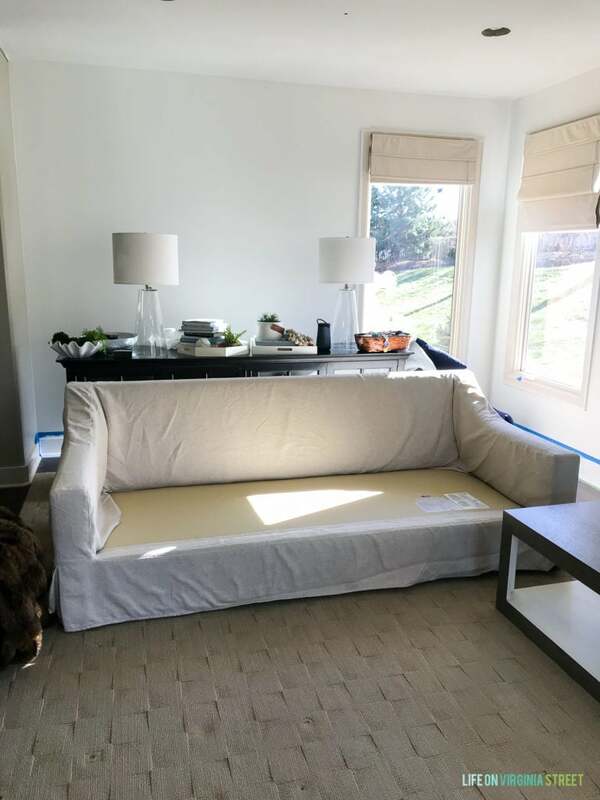 I read review after review on sites like Houzz about the quality of various Pottery Barn couches (and the fabrics, specifically), so I knew what not to order. After taking a big chance, I ordered two of the York sofas last September during their buy more, save more sale. Today I’ll be sharing our view after owning the sofas for some time. This post contains affiliate links for your shopping convenience. Please know this is in no way sponsored, and we fully paid for the sofas with our own money! Click here to read my full disclosure policy. 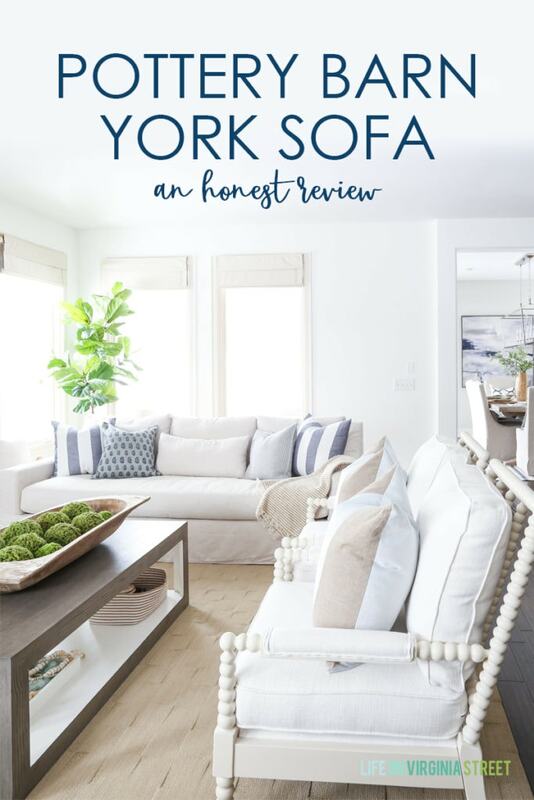 Now that we’ve owned our sofas for over three months, I thought I would publish my first Pottery Barn York Sofa review. My plan down the road is to continue to update this post at various milestones (six months, a year, etc.) so it can be a constant source of info. You’ll find these updates near the end of the post in chronological order. Because of the layout of our living room, we’ve always had two sofas. We prefer to lay down when we are watching TV because of the angles, so keep in mind several of our decisions were based upon how we use the space. Before I get into the general pros and cons with the sofas, I want to share the exact specifications of the sofas we ordered. We currently have the Pottery Barn York Slip-Covered Slope Arm Sofas. We went with the 95″ Grand Sofa with the bench cushion. The fabric we selected is the Performance Everydaylinen™ by Crypton® Home in the Oatmeal color. We do not have kids but we do have four cats. We underestimated how much the cats would love the pillow backs (after having tight back sofas previously). I’ll share more details later in the post on how this has impacted wear. We want our home to be livable, so nothing is considered precious. We occasionally eat on our sofas, drink on our sofas, etc. We want our guests (and us) to feel comfortable. Gorgeous design. After looking through hundreds of sofas, there weren’t any that I loved as much from a design standpoint. I now get more comments and questions on the sofas than anything I have owned in the past. It definitely has that “look” that everyone loves so much! I also love how many options you have on this sofa. From the fabric, to the arm style, to the depth to the length (and more!) there is a lot of flexibility in customizing a look that is right for your home. You can see all the various shapes, sizes and styles here (including chairs and sectionals!). Wears well. The Performance Everydaylinen™ by Crypton® Home fabric is amazing. I actually took two samples home from the store before placing my order to test colors. I was going back and forth between the Oatmeal color and the Stone (which was on display at the store). I was worried the Oatmeal would be too light but in all honesty, I think I would have felt the Stone was too dark for our home if I went that route. Before I returned the samples, I actually poured red wine on the Oatmeal sample. It beaded up and wiped right off without any work! So, I got a little crazy and poured more on and really pushed it into the fabric. It still came out with water. After three months, we don’t have any spots, pilling, or any other signs of wear. We also frequently wear dark denim, and have not had an issues with it bleeding onto or wearing into the fabric. Flexibility. The version I ordered is a slipcover and I’m not sure I would have ordered it at this price if it wasn’t. But, it isn’t the old-school ill-fitting versions of the past. It fits well and the best part is, the Performance Everydaylinen™ by Crypton® Home is dry cleanable. Several other fabric options they offered are actually machine washable, as well. 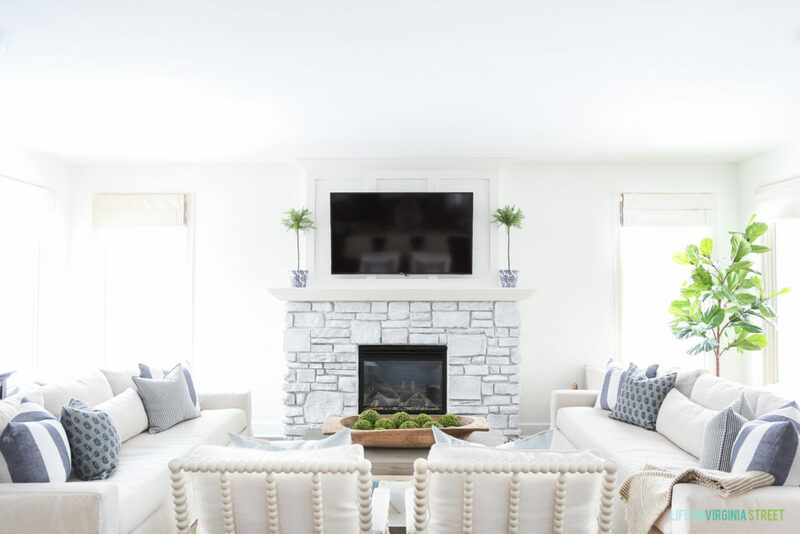 There is so much flexibility because you can re-use the frame and totally change your look with new slipcovers (Pottery Barn sells them separately as an option). I was also told you can order any of the cushions separately down the road if need be. I’m assuming they’re not cheap, but if one gets ruined, at least it doesn’t mean I have to buy a new sofa. Comfort level – and it passes the ‘husband test’. My husband was actually against me ordering new sofas because he loved our prior Bernhardts so much. However, I agreed to get him to a local store to test one. I could tell, aside from the price, he begrudgingly loved it. Prior to writing this post I asked him his thoughts. He said it is a lot more comfy and spacious than our last sofas. He said it’s really nice to take a nap on (a critical factor for him). He still claims we didn’t “need” them but he does love them. Minimal leakage. That’s a weird one, huh? But after more than three months, I can count on one had the number of feathers that have come out of either sofa. With our prior Bernhardt sofas, it felt like it was a daily occurrence! 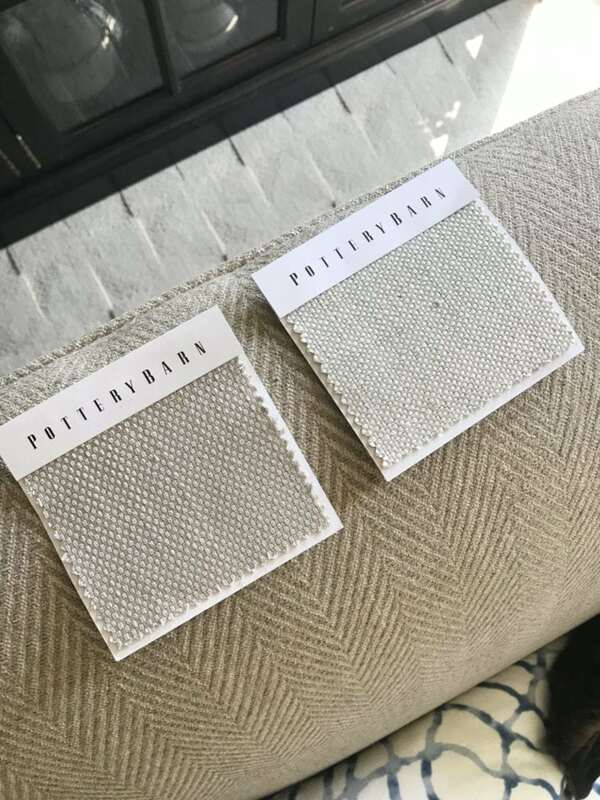 Shown below, the Performance Everydaylinen™ by Crypton® Home fabric in Stone (left) and Oatmeal (right). This is from my iPhone but shows a comparison of the two against or current sofa at the time. Lead time. I am not a patient person so the wait nearly killed me. Especially when I was told they would take 5-7 weeks at time of order and it was closer to 11 once they were delivered. I ordered them on September 4th, with an expected arrival date of 10/9-11/2. They were finally delivered on 11/25. The cost. The sofas are not cheap. However, the quality is apparent and each one is custom made to your specifications. I personally believe that Pottery Barn has frequent enough sales (from 15-30% off) that you should never pay full price for this sofa. If it’s not on sale when you want to buy it, chances are within a few weeks it will be on sale. Because we ordered two during the buy more, get more sale, ours were 30% off. When you’re spending that much money, the discount adds up in a hurry! We opted to go with the deep version since we are both on the taller side (I’m 5’8″ and my husband is 6’2″). Additionally, we mostly are laying down when we use our sofas so we preferred the extra depth. However, without the lumbar pillows in position, it makes it a bit tougher to sit up comfortably on the couch. So, if you opt for the deeper version, just know going in that you will likely always need the included lumbar pillows to sit comfortably. Not a major con, just something to be aware of. I never ended up ironing or steaming mine and most of the wrinkles have naturally fallen out over time. I’ve had good intentions of getting rid of all of them, but just haven’t gotten around to it. The slipcover on the frame was a bit loose on the one the way it was delivered. See the photo above (specifically the left arm). I worked on it for about ten minutes (tucking in the fabric tighter) and it now looks tight and as good as the other sofa. For the most part, the sofas look like new. Typically every week, I rotate and fluff the cushions. You can see how they look here without any update (with a week of laying on them and the cats smashing the upper cushions). I took these with my iPhone on a Monday without making any adjustments (other than moving throws) just so you can see real life. Nothing horrible, it just looks sloppy. With the the bench cushion, it’s a little more noticeable in areas. After less than five minutes of fluffing and rotating, it basically looks like new again. I basically lay the cushions flat, press on them in a circular motion with my hands, and then shake upside down and they’re good. The rotation probably isn’t necessary in most homes, but I’m trying to rotate which cushion the cats sleep on. This is the beauty of the down cushions. They can be re-shaped back to normal, unlike cheap poly-filled cushions. And again once the lumbar pillows are added back on. And a final shot with my “real” camera to show you how it looks with other throw pillows. My husband makes me store “his” lumbar pillows in the basket on the side of the couch. Basically three less pillows for him to throw on the floor when he’s ready to lay on it to watch TV 😉 In the picture below, I actually left just the middle lumbar pillow for balance. You can see I really do need to steam the skirt on that one, as that’s where most of the wrinkles remain. I would argue the cats are harder on the sofas than most people. They’re testing it in ways most probably never thought possible 😉 There are days two of them (at nearly 15 pounds each) will be on one cushion for eight hours straight. But, they clearly think it’s the best seat in the house because they never move! Since we know they won’t leave the cushions alone, I usually have blankets on the backs of the sofas now to at least contain some of the fur. Not much has changed with our sofas since my three-month review. However, we’ve experienced more spills and should-be-stains, but I can’t say enough about the fabric we selected. We have been shocked by the durability and stain resistance of the Performance Everydaylinen™ by Crypton® Home fabric. We’ve spilled wine, food, chocolate (that melted overnight), cat sickness one week, and more. We’ve been able to clean it all with a wet paper towel (just water!) and a little effort. The stains have yet to stick and everything that’s come the fabric’s way in the past year has been removed. I can’t say enough good things about this fabric! We still love the comfort factor of our sofas, as well. We’ve found that they have gotten comfier with time and the fabric has worn so well. The cats have continued to smash the cushions as much as possible, but with a little fluffing they go right back to their normal shape. We haven’t had any issues with the fabric pilling either. The sofas essentially still look as good as the day we got them. In fact, we love the sofas so much, we’re considering ordering a Pottery Barn sectional for another room in our home! Even Kurtis is on board (shockingly) because he loves our sofas so much! Here’s a more current look at the sofas to show how they’ve worn – and this wasn’t with much straightening at all. And, as much as I love them, I still of the believe you should always buy Pottery Barn sofas on sale. They do sales frequently enough, that you should wait until you can get, at minimum, 20% off! Overall, we are extremely happy with our Pottery Barn York Sofa selection! We have had zero issues (other than dealing with the cats that are obsessed with them). Because we use the sofas while laying down, the bench cushion was definitely the way to go and is so comfortable! We would argue it’s even more comfortable than our bed. If you are considering multiple fabric options, do your research! I found lots of complaints on various fabrics (although I think most were older on a fabric no longer offered). The Performance Everydaylinen™ by Crypton® Home has so far lived up to its hype and seems like the perfect fabric for us. We get the look of linen without the maintenance! If you buy them on sale, I think they are worth the investment! We couldn’t be happier with them! I hope you found this review helpful! Again, I’ll plan to update this review at various milestones to make sure we are still loving the sofas. If you have any questions at all on anything I didn’t cover, please feel free to leave a comment and I’ll get back to you as soon as possible! Side note: I encourage you to check out the comments at the bottom of this post for feedback from others that have experience (or other questions) with these sofas! Thank you! I’m guessing yes, but it may be worth getting a sample from a local store or ordering a sample online and testing it. I was really impressed with the durability. We wear dark denim on ours frequently and have never had issues with it rubbing off (like it can on so many other surfaces)! I hope that helps! Hi there! Where is your coffee table from? I got mine at Nebraska Furniture Mart, but you can also get it here: https://rstyle.me/n/cub4wq75re. We purchased one as well about the same time as you! Thankfully it came in 4 weeks early and got it in time for Christmas which was nice. We LOVE it. Its the most comfortable sofa we ever had. My husband and I went and tried the (much more affordable) crate and barrel lounge sofa – but there was no comparison. Worth the money for sure. We do have kids (1 and 4 years old) and we went with the upholstered version (the slip covered doesn’t really fit our style) and I still feel like its pretty kid friendly. We can take off and was the pillow covers if needed. We could also order a slipcover if we wanted to change it up down the road. I totally agree that the bench cushion is so much more comfortable than multi cushion. We had 4 adults sitting comfortably on it with room to space! So glad you did this review – I was so frustrated trying to find review of this sofa before we bought it…..but so glad we took the plunge! Thank you so much for sharing your experience as I’m sure this will be helpful to other readers as well! I think the biggest issue with our delayed delivery is the size of our market. My understanding is that they were ready two weeks prior but the delivery company was waiting for more items to fill their truck to make the trip from Kansas City to Omaha. And I know what you mean on lack of reviews!! That was one of my biggest frustrations prior to ordering because I couldn’t find any information on this particular sofa! So glad to hear you’re loving yours as well! Your sofas are lovely as is your entire home! I did want to mention to your readers that I have a Pottery Barn sofa, different style, with a performance fabric slipcover. Unfortunately I can’t recall the name but within a year the fabric was pilling terribly and the sofa was in a room we rarely use. I wrote Pottery Barn and there response was that it was to be expected as normal wear and tear. I was very disappointed in my 3000 dollar sofa but more disappointed in Pottery Barns response. I hope you have a different fabric and better luck. Thank you! And I appreciate you sharing your experience. I’m wondering if you have the Performance Tweed? That is the one where I found review after review with issues. But I could never find any problems with the Performance Linen. I’m hoping it holds up over time! That’s disappointing on their service level – I would expect more from them as well! When I read all those reviews, I did see a common theme that those that went to a store got a better resolution than calling the main number. It may be worth a try! Yes, it was the Performance Tweed I think. Guess I should have done a little more research first. Lesson learned. I ordered on line and yes I just called the main number and the customer service was terrible. The frame is fine so I should order a new slipcover. It has been about 4 years and the sofa is sitting in the basement. Tricia, was it the sunbrella tweed? We are ordering the York sectional this weekend and were hoping to get it in this fabric, but now I’m nervous! I’m not sure what Tricia had, but my understanding is they no longer carry the tweed that had all the issues (it was from 3-5 years ago). I think the Sunbrella versions are much more durable based on my discussion with their sales associates because I almost picked one of them too! Sarah, Thanks so much! We went in and spoke with someone in the design studio. She said that the manufacturer re-worked the performance tweed, but she still wouldn’t recommend it. She directed us towards the crypton linen or the Sunbrella. We LOVE the look of the linen, but…toddlers 😳. I’ve committed myself to the idea that this might be our basement sofa in a few years…because honestly with pets or kids, nothing lasts forever! What are the dimensions of your room (if you don’t mind me asking)? I’m struggling with whether or not to get the deep seated sectional for fear it will eat up the room! But I love the look of the double pillows and the arm on the deep just looks so much more grand! Just wanted to say I agree that Pottery Barn customer service is the worst! I ordered the sofa through a sales consultant because she said she got credit for it. Then she messed up my non-refundable order! Had to fight with her and customer service to fix my order since it wasn’t my mistake! Then because of that mix up I didn’t get any key rewards for my purchase and they won’t reply to any of my e-mails regarding the issue. Also spent over an hour on hold trying to talk to a person and then they just disconnected me! Needless to say they aren’t a big brand and must not care about customer services since everyone buys their products anyway. Sad. I had problems with pulling as well, but after about 2-3 months of back and forth negotiating with them, they were going to give me a new replacement or almost $2k back on my pottery barn card. I build the entire room around the particular fabric and didn’t like any others given the rest of the furniture in the room, so opted for the money back. I thought I’d have almost a $2k store credit to work through, but after 2 months, then credit card company sent me a check!!! Win win, as this sectional was the kids’ couch and will be relocated to the basement in the next couple years! Thank you, thank you!! Such a great review including so many different considerations when buying a sofa especially when it needs to pass the hubby nap test! I’ve loved the bench cushion design for a while but I still have a traditional cushion chaise longe sectional with the suede microfiber that is super easy to throw in the wash. Wondered if having 1 big cushion is harder/inconvenient to clean for 1 spot. Also is the bench cushion made of down like the seat backs or a combo of down and fill? Love this post, Sarah! I love your sofas so much and it’s so helpful to read a thorough review before buying such an investment piece. I’m aways off from getting my dream sofa (Considering my slipcover has chocolate and marker smeared on it right now – KIDS) but I’m saving all this info for later. I also found the reader comment with kids super helpful too. I have a Pottery Barn couch now for 5 yrs with a slip cover. The down side is that every sofa we sit on doesn’t measure up the comfort this one gives us. We have a canvas slipcover for grandkids and big kids eating dinner on. I bought it on sale and have never regretted the money well spent. I love the kitties! And they are giving the sofa a terrific endorsement–they know how to find comfort! Our 45-pound dog has ruined the back cushions on our loveseat, lying on them in front of our big window–but that’s his place now, and I wouldn’t change it. I’m wondering if you have ever tried washing your slipcover? I’ve heard of people washing the morning on gentle cycle? I really love the look of the linen but need it to be washable with 2 toddlers. I also heard from the sales associate that the 100% polyester fabrics often have pilling problems. Hi! I have a quick question…not regarding the couch’s, however those white spindle chairs!!!! Where did you find them? I am in love with them! Thanks! Thank you! I got them from Wayfair. Here is the direct link: https://rstyle.me/n/ctvpmt75re. How have the spindle chairs held up? I think I would like to replicate your look. I’ve always been afraid to order furniture online without sitting on and touching it. Hi Alli – we’ve been very happy with them so far! They honestly don’t get sat in that frequently, but one of my cats sleeps on one of the back cushions non-stop and surprisingly it hasn’t gotten too misshapen. I hope that helps! I love your living room rug. Where is it from. Thank you! It’s actually carpet that is inset into our hardwood so unfortunately I don’t have any info on it. Sorry! We actually have the exact same York sofa in the same color and fabric in our living room. I would really like to purchase new chairs and was looking at some spindle chairs and then saw your post. Can you tell me what wood color and fabric color you went with for those? I currently have off-white chairs in that room with the couch and they are just way too yellow with the sofa. They’re really bothering me. I went with the ivory spindles and the Bevin Natural fabric. We’ve been really happy with both selections. I hope that helps! This is exactly the sofa and fabric I’m researching and was so happy to find your great review! I’m undecided about the cushion fill. Are you happy with the 100% down and are they holding up for you? Yes, we’re very happy with the down fill! With our cats constantly laying on the cushions, we’ve had horrible experience with polyfill in the past. This fluffs back up fairly easily with very little work. I hope that helps! How long have you had your sofa? I am looking at this exact style and fabric but standard depth. Our current PB sofa looks so junkie. The back cushions have smooshed down 5 inches below the frame. Just looks a saggy mess. I have a 2 and 5 yo and they will climb all over it. My husband wants a tightback sofa but those just aren’t my style but I don’t want to invest in new sofas every 3 years. Just wondering how old your sofa is now and what you think. Hello. Thanks for the review. It’s much needed as I’m looking/researching the best sofa to invest in. My question is. Are the sofas more white? They photograph white to me. Which I’m looking for white. They aren’t white but are definitely very light. They do offer a white version though if that is more what you are looking for. This is a light oatmeal color and very neutral. I hope that helps! I *just* got my York slope arm sofa (bench cushion, Performance Basketweave, Light Gray) delivered and couldn’t be happier. Waited for the Buy More/Save More sale to pull the trigger. Thanks so much for the thorough review – couch shopping is kind of terrible, so your posts were a life-saver. Hoping it holds up to 3 kids and 2 dogs! And can’t wait to see the new fireplace – that is the next project on my list (though a ways out). I’m so happy to hear that! Thanks so much for the feedback! Love your post and review of pottery barn! Karen, I am about to pull the trigger on a sofa with the same Premium Performance Basketweave, Light Gray. How is it holding up so far? Which gray color did you get Lauren? Can you post a pic of the light gray color?! We only have the Oatmeal version. Sorry! Do you flip over the big bench cushion? Yes, we do! I don’t do it as often as I do with the other cushions. Maybe once a month or so? We recently purchase two York love seats Basketweave in the oatmeal color. My question to you is how did you decide which arm to choose. I did not want the roll arm because I didn’t want formal. The sales person that helped us ordered square. I didn’t;t realize it came in a sloped arm. Now I prefer the sloped arm that you have. I am hoping to change it. Will the square arm be too high? Does it make a difference. Thanks. I went back and forth on the square and slope arm too (I also knew I didn’t want the roll arm). I actually like the look of both (our store had a square arm in stock). Ultimately I just decided I liked the slope arm slightly better. They actually look very similar from the front, you just notice the difference more in the side profile. I thought the square arm would be too high, as well, so I had my husband come to the store and lay on the couch and he was okay with the height of the arm (it was still comfy to lay on). I hope that helps! HI, This review is great! I’m also trying to decide between the slope arm vs square. I’m getting the standard depth and grand length with bench seat because I have a long skinny living room. My hang up is fabric options. In your picture of swatches it really looks like Sunbrella performance club tweed pebble. Are you sure you got Performance everyday linen oatmeal ? I can’t really tell from the pictures. After reading this I got a swatch of the Everyday linen in oatmeal and it looks very earthy – natural and woven with a slight shiney red hue. My second choice fabric is the warm white denim. On line has little to no fabric options but I think the stores can look up or have the ability to order more options. I’m glad you found it helpful! And yes, I’m 100% sure mine are the Performance Everyday Linen by Crypton in the Oatmeal color. The swatch to me is really hard to gauge and when seen in a larger scale, I feel like they change a bit. It has held up really well! What is the cushions made of ? Memory foam or down?or is there a choice? They cushions are down-wrapped. I don’t believe there is a choice on this one. We are trying to choose a replacement fabric for our tweed fabric that looked horrible just a month after we purchased. I love the fabric you have, but wondering if you have had any pilling or other wear that you aren’t happy with? Also, is the fabric soft feeling? We have had zero issues with pilling. I wouldn’t necessarily say the fabric is soft, but it also doesn’t feel rough on your skin like some linen can. It’s definitely comfortable to lay and sit on. I hope that helps! I just bought the York deep sofa in Chenille Indigo. Hmmm- delivered maybe 6 weeks ago?So far I love it. The 2 dogs also love it. 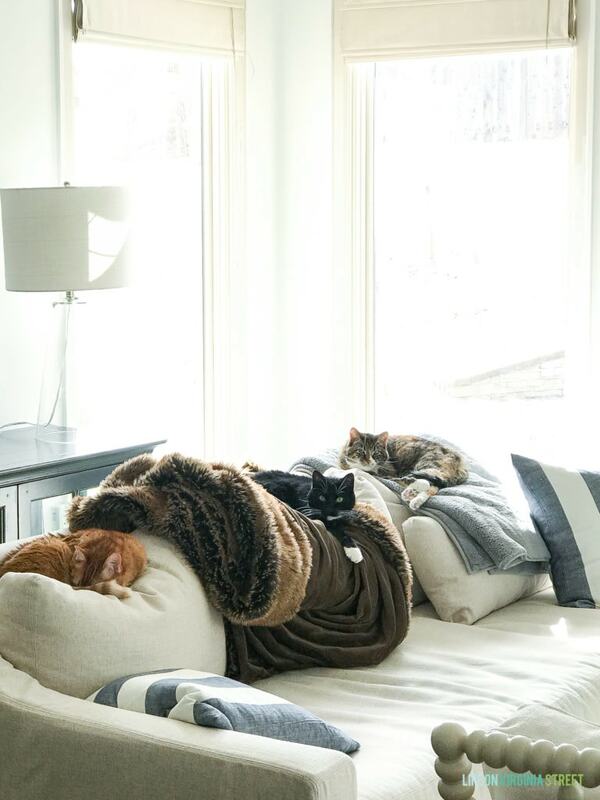 They squish the back cushions down as your kitties do. I did not get the bench seat. I maybe regret that? Whenever I sit the seat cushion does get a bit squishy…It pops up right away when you fix them up. It is extremely comfy- I have fallen asleep on it many times. So far I love it. I also bought the York chair in the Oatmeal herringbone slope are…not deep but regular…I bought 2 of those. Really happy with them although have not used them much as they are in the living room. Do your cats scratch furniture? Wondering how the fabric holds up to cat claws. Thanks. Is it difficult to get the cat hair off? 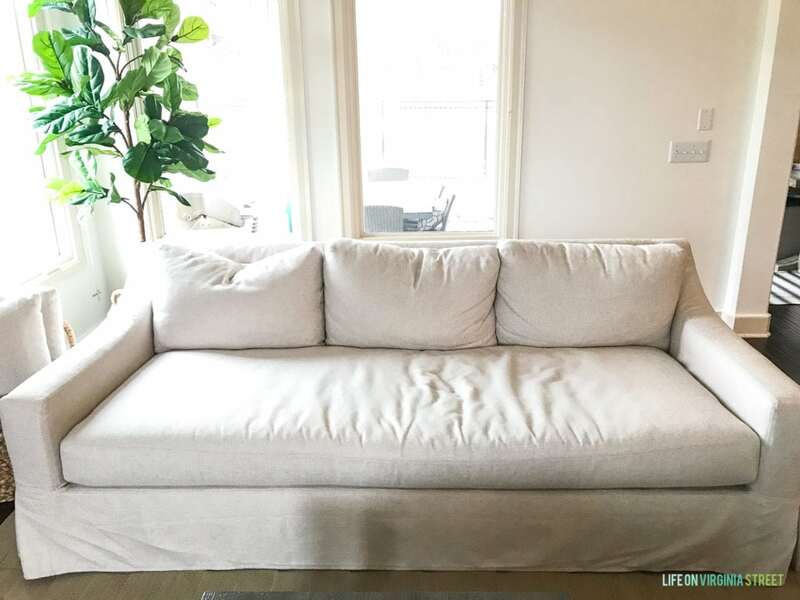 We have two large dogs that shed a ton and so we’ve always had leather couches, but I really like the look of the PB linen sofas and want to give them a try. But I don’t want to spend an hour every day vacuuming hair off of them. It’s fairly easy. It doesn’t work into the fabric like it does on other furniture. We either use a lint roller or our hand vaccuum and it comes off easily! Has anyone found pillow covers that fit the York’s lumbar pillows? I’m loving the sofa, but would like to use the existing lumbar pillows and just change the covers out, but I don’t see any from Pottery Barn that fit the dimensions. Their lumbar pillow covers are all too small. This review is long overdue, but I had to finally stop by to give you a big thank you for this couch review, Sarah! I found your blog earlier this year when I was trying to research this exact couch. (And subsequently became a fan of your blog and read it frequently). Your review was so helpful since we live in Montana and don’t have access to any PB stores except when we travel. 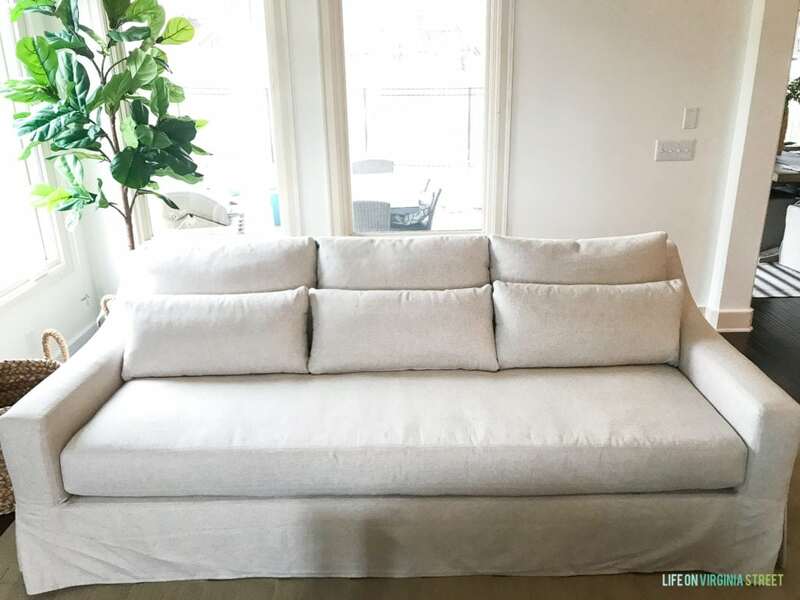 After ordering some sample fabrics from PB online, we purchased this sofa in the upholstered, slope arm version in Oatmeal Crypton fabric during the Buy More, Save More event. We have a 2 going on 3 year old daughter, small dog, and active family. Our couch looks as new as the day we got it. The Crypton fabric has lived up to the hype and dirt, food, juice, washable markers, etc. have wiped right off. The single cushion is deep enough to snuggle or sleep on, and the length is so comfortable for our whole family to fit on. I fluff the back cushions regularly, but only flip all of the cushions over or around about once a month or less. They’ve held up beautifully so far. Thank you so much for your thorough review and I hope my comment can help anyone else thinking about ordering this couch. Thank you so much for the feedback, Cat! I’m so glad you found it helpful and are enjoying the sofa as well! I am looking to buy a PB sofa. My top choices for fabrics are the performance tweet and the everyday linen but after reading many reviews I think I will skip the tweel. I was wondering if you ever tried pen marks on your ED linen? I tried it in the sample and can’t get it off. This is the only thing holding me back. I was hoping everything would come right off this fabric. Is there ways to get a pen mark off? We haven’t ever had pen on ours so, unfortunately, I can’t help on that one. But everything else that has gotten on ours (wine, coffee, dirt, red icing from cake, etc.) has come out with just water! 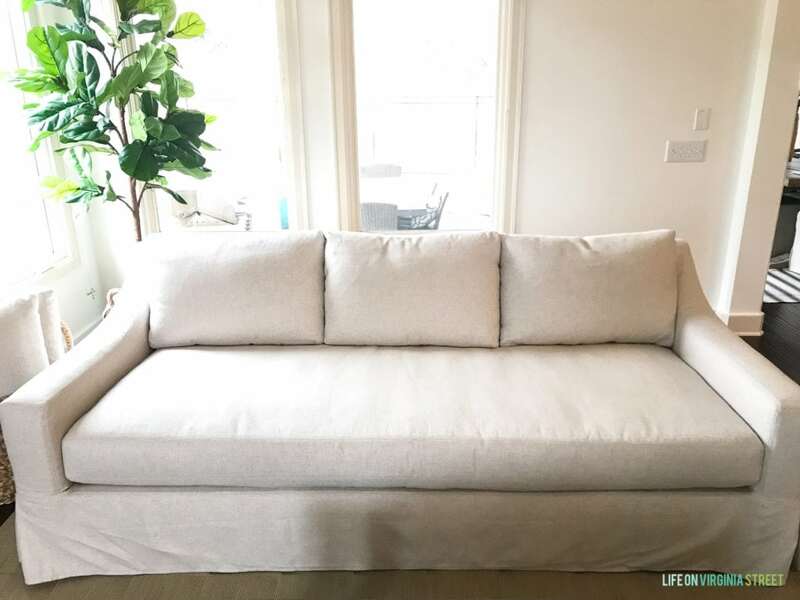 I’ve done a lot of reading while trying to determine what kind of sofa should replace a not very old but unfortunately a very poor buy – a Quatrine which has never held its shape despite probably being “well made.” So frustrating! Anyway, I was considering the PB Jake, similar to the York but am now going to check out the York as I didn’t realize it also came in the bench seat option. I really appreciate your posts and am enjoying getting familiar with your blog – thank you! I’m glad you found it helpful Hilary! Good luck on your search! Little Utz – do you prefer the york deep seat over the york regular depth since you have both? We have not been able to sit in a regular depth york as they don’t have them in any of their stores. Thank you for this review! We are looking at buying the exact same sofa as a discounted floor model right now! We have 2 cats though and I am terribly nervous about them scratching the sofa to shreds! Do your cats scratch on your couches? I am worried they might like the fabric and scratch up the sides or back of the couch!. Yes, it’s fairly tightly woven. And I’m guessing if they have claws they could snag it on the arms if they were doing their scratching stretches but I’m not 100% sure! Your review and all of the comments have been extremely helpful. I have gone back and forth over the PB fabric options and just this morning settles on the Crypton Everyday Linen in the stone color which I think is still light enough for my liking. I feel so comforted in reading about your experience with this fabric. Thank you so much . So happy to hear you found it helpful! I hope you enjoy your new sofa! This post has been amazing for me! I was so close to purchasing a the PB Comfort sofa until I got scared off by all of the horrible fabric reviews. The Crypton Everydaylinen sounds like it could be the answer! Now I just need really need help to decide on color. 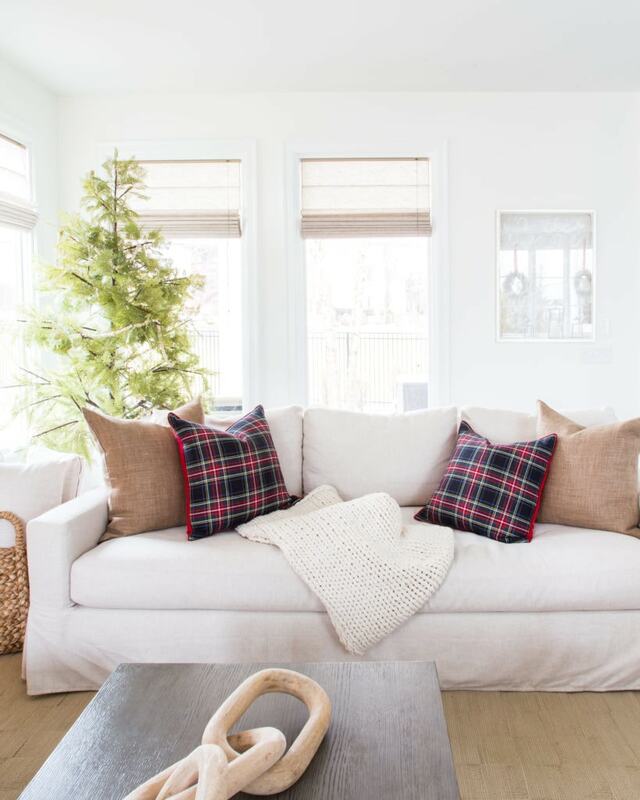 I very much want the white couch look and so was going to go with the Crypton ivory but yours look beautifully white in the oatmeal. Did you consider the ivory at all? 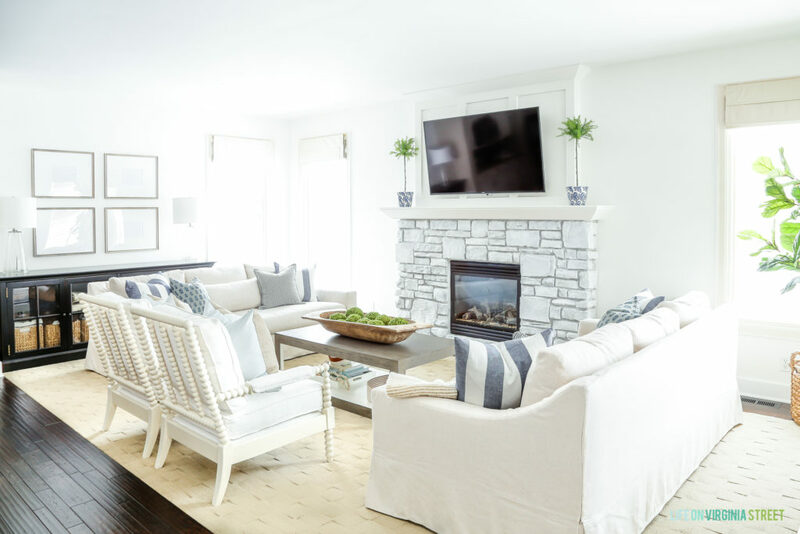 I am worried about a stark white look but want the coastal vibe and the light clean look that a white couch provides. We did order the Alexandria marble top coffee table and end table and in the store the marble top started to look yellow when I put a white fabric sample next to them. Just could use advice on how white to go for the white couch look. We have 3 kids and a dog. I would research, but I feel like Performance fabrics are your best bet! From what I’ve heard, they hold up super well. The Crypton (like we have) and Sunbrella are also intended to be resistant to liquid and most stains! Hey Sarah, great review! Quick question – do the lumbar pillows also have down filling? Or are they poly blend? I have back issues, and it would be good to know what they are made of! I just double-checked ours and the pillows are down as well and filled very full and firm! i am loving this sofa and have been saving to purchase one. I am hoping they have a 30% sale this coming Memorial Day weekend because I plan to purchase it. My only concern is how well they hold up with wear and tear. i want it for a family room where teens will be sitting 7 napping on it almost every day. Thank you! Ours has held up well after a year and four months. We use them daily (and lay on them) but don’t have kids so I’m not sure on that aspect. We’ve been happy with how they are wearing though!